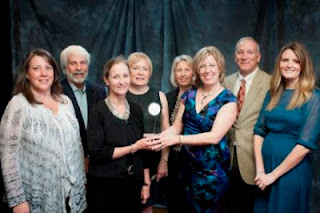 Athertyn at Haverford Reserve, the Main Line’s premier lifestyle community, has been named Best Lifestyle Community for 2012 by the Home Builders Associations of Bucks and Montgomery, and Chester and Delaware Counties (HBA). The awards were presented at the Synergy Awards regional ceremony, held May 17 at the Radisson Valley Forge. Athertyn’s location is unsurpassed. Beautifully situated on a scenic plateau, the private community is part of the 209-acre Haverford Reserve, which includes 124 acres of preserved natural space. Open land of this magnitude in the heart of the Main Line is virtually impossible to find. Beyond that, Athertyn offers the carefree style of living desired by more and more active adults. Residents enjoy the privacy of their elegant condominium homes unencumbered by the maintenance and upkeep that comes with single-family houses. They also have exclusive access to a range of services and amenities, including the clubhouse, which features a host of activities and enriching programs.